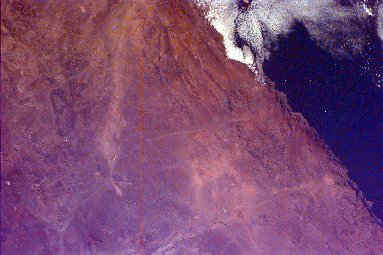 Estimated to be approximately 15 million years old, the Atacama Desert is vast area of 70,000 square miles located in northern Chile comprised of salt basins and volcanoes. Many researchers describe the soil in the Atacama Desert to be \"mars-like\" from the fact that the majority of the desert is dry and lifeless. To understand how the Atacama Desert receives very little moisture, it is important to know the process of precipitation shadowing (aka: Rain Shadowing). 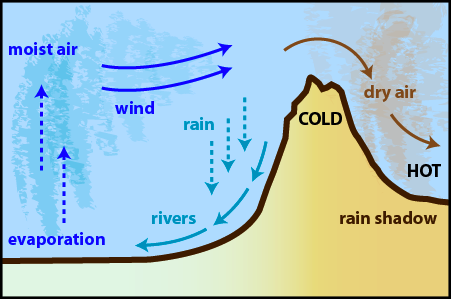 As the diagram (right) suggests, precipitation shadows occur when warm, moist air, carried by winds, moves up one side of a mountain. As the air rises in altitude, it cools and condenses into vapor and eventually precipitates down the slope it climbed up from. Thus only the remaining dry air gets to reach the peak and flow into the other side of the mountain. As a result, these areas get very little or no rainfall. Despite lack of life inhabiting the region, the Atacama Desert is rich in minerals such as copper and nitrate. 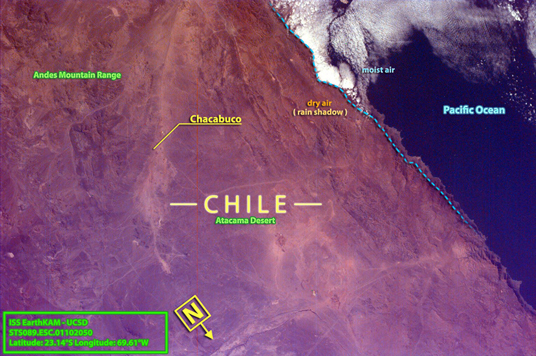 During the 1930’s many mining companies established mining towns over the desert while natural nitrate production was a major indicator in Chile’s economy. However, when Germany discovered how to artificially produce nitrate, mining companies, as well as the national economy, took a huge hit and many mining towns were forced to shut down and leaving behind a mausoleum of ghost towns in the desert. Chacabuco, one of the abandoned mine towns, was later used as a concentration camp in 1973 for political prisoners and disbanded threes years later. Nevertheless, several copper and nitrate mines are still operational and currently upholding Chile as the world’s largest producer of Sodium Nitrate. NASA researchers believe that the soil in the Atacama Desert is very similar to that on Mars due to their shared characteristics of lacking essential minerals necessary to sustain life. This comparison encouraged many researchers to simulate the terrain of mars on the Atacama Desert’s driest regions to test out new instruments for future Mars expeditions.